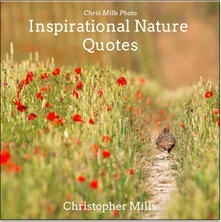 My first eBook – Chris Mills Photo – Inspirational Nature Quotes’ has been published. It contains a collection of my images along with some of my favourite inspirational quotes about nature and wildlife. For some time now, I have been tweeting regularly popular quotes about nature, alongside photographs I have taken of wildlife and nature. Therefore, my hope is that these nature quotes inspire others to cherish nature and wildlife more. Due to the popularity of my tweets, it prompted me to publish this eBook. I am also currently working on a printed version, which I hope will be published in 2016.